Vivacious: a word that describes the passionate, the spirited, and those who are zealous for life. It is one of Pantone’s colors of the year for 2013 and seduces those romantic personalities thriving in the month of February. 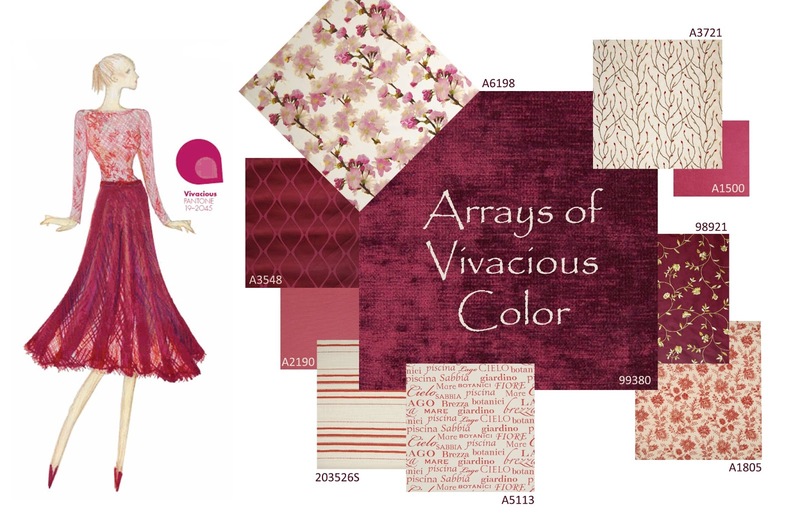 It is a desirable, energetic, and lively color drawn also from the 2013 jewel tone trend prevalent in fashion and design. “Dare to dream. Seize the day. Live and be loved,” these fabrics seem to call out to passersby. Picture the lush velvet meandering around a tufted sofa while embracing side pillows covered in the playful floral blossom. Acknowledging the love affair, but choosing to stand alone in its elegance, an adjacent French Bergère chair radiates the suns finger tips of light that seem to explore its diamond dress of silky sateen. Find the fabrics shown above and more New Fabrics Every Month on our website.